“In those days, and in that time, saith the LORD, the iniquity of Israel shall be sought for, and there shall be none; and the sins of Judah, and they shall not be found: for I will pardon them whom I reserve” (Jeremiah 50:20 KJV). Israel awaits this most magnificent pardon! Many—yea, most—have great difficulty reconciling the nation Israel’s ungodly behavior in history with God’s future plans for her in prophecy. After all, her willful pagan idolatry for numerous centuries culminated in her rejecting Messiah (Jesus) and nailing Him to Calvary’s tree! How could the LORD God ever make her His people, His kingdom of priests that He originally intended her to be (Exodus 19:3-6)? Satan realized that once he corrupted Israel, God could not use her to overthrow Satan’s plans for Earth. However, God had already planned well in advance Israel’s redemption: He would use her rejected Messiah’s shed blood to institute the New Covenant. 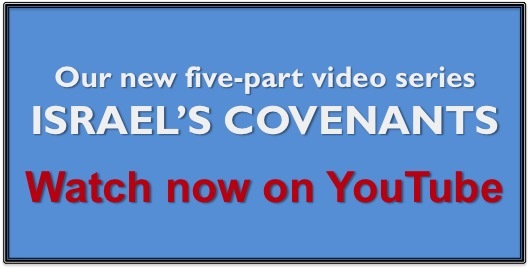 This new covenant will take care of her breaking the Old Covenant (see Jeremiah 31:31-34). Christ’s blood will wash away her sins; yea, she will be eternally purified. Never again will Israel have intimate relations with (worthless) idols. “Unto him that loved us, and washed us from our sins in his own blood,…” (Revelation 1:5). “For finding fault with them, he saith [Jeremiah 31:31-34], Behold, the days come, saith the Lord, when I will make a new covenant with the house of Israel and with the house of Judah:… I will be to them a God, and they shall be to me a people:…. for all shall know me, from the least to the greatest. For I will be merciful to their unrighteousness, and their sins and their iniquities will I remember no more” (Hebrews 8:8-12, in part). Notice these other Second Coming verses concerning Israel’s national forgiveness: “He will turn again, he will have compassion upon us; he will subdue our iniquities; and thou wilt cast all their sins into the depths of the sea” (Micah 7:19). “Repent ye therefore, and be converted, that your sins may be blotted out, when the times of refreshing shall come from the presence of the Lord” (Acts 3:19). “For this is my covenant unto them, when I shall take away their sins” (Romans 11:27). Posted on May 2, 2018 Categories blood of Christ, Israel's redemption and restoration, Jesus Christ, New Covenant, prophecy, redemption, sanctification, Second Coming of Christ, The Nation IsraelLeave a comment on Israel Pardoned in Full!